The combination of pine leaves, berries and pine cones in a crystal cylinder makes this candle decoration a spectacle to behold. This is a perfect centerpiece for your dining table on Christmas Eve. 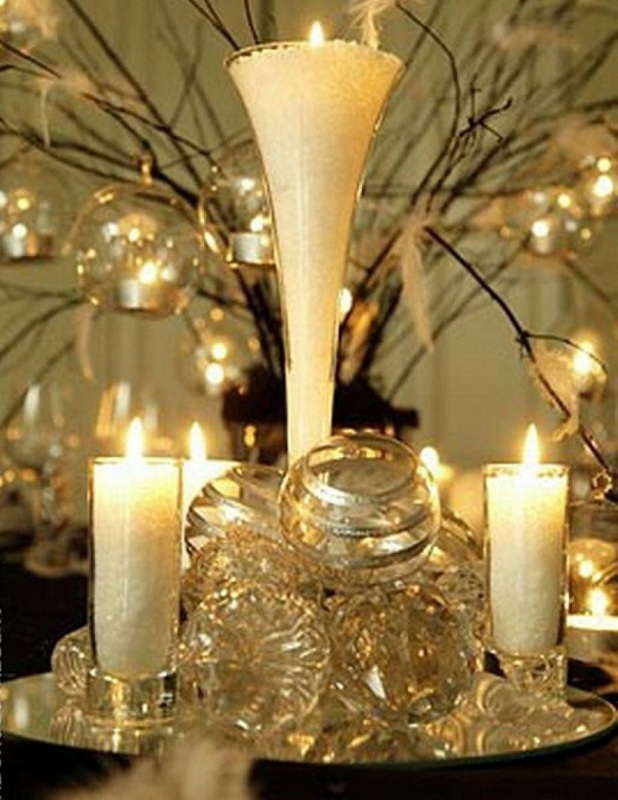 Create a snowy effect on your candle centerpiece with the use of epsom salt. Cover your candle with some glue and dip it in a dash of epsom salt. Set it on these clear crystal jars and voila! You can transform those big candles into a beautiful delight by simply putting some ribbons and ornaments on it. Then, arrange it on a red platter and you have this gorgeous centerpiece. 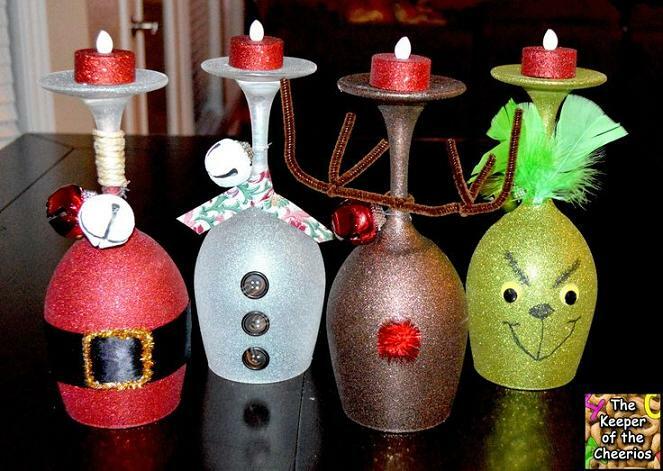 You don’t have to spend bucks on those pre-decorated Christmas candles. Why would you if you can just decorate your own. You just need a clear glass and a candle that can fit inside it. Decorate the glass with ribbons and you have this eye-catchy piece. 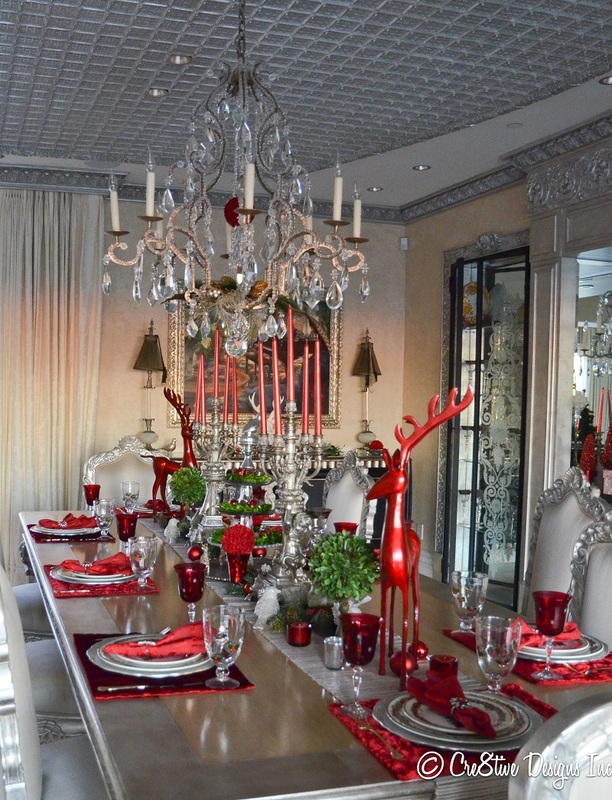 The combination of gold and red ornaments make this Christmas table setting a sight to behold. This decorating idea is so gorgeous and very elegant. 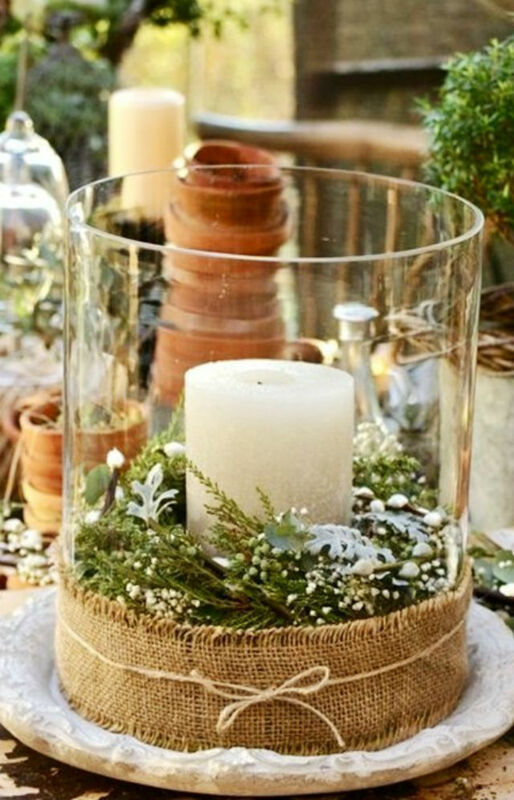 For someone who loves flowers and fresh decorations, this is one good way to decorate a Christmas candle. The red color of the flowers complemented well with the pine leaves. All clear and elegant – that’s what this Christmas candle arrangement is all about. The shining, glimmering light of candles reflects in to these crystal ornaments and creates this magical feel. 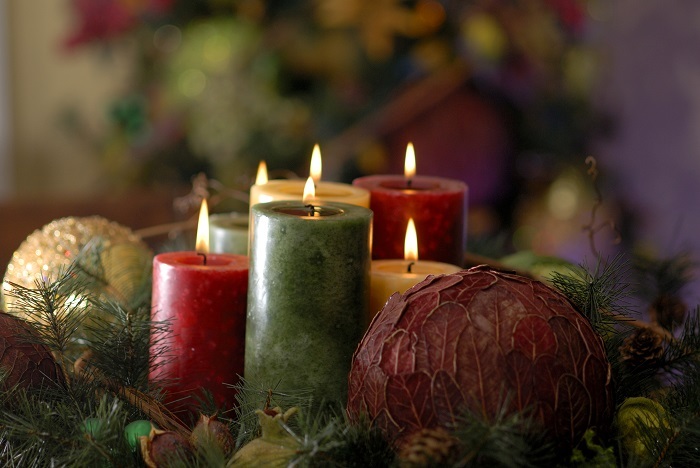 Aside from being a door decoration, Christmas wreath can be used to make your candle arrangement more fabulous. 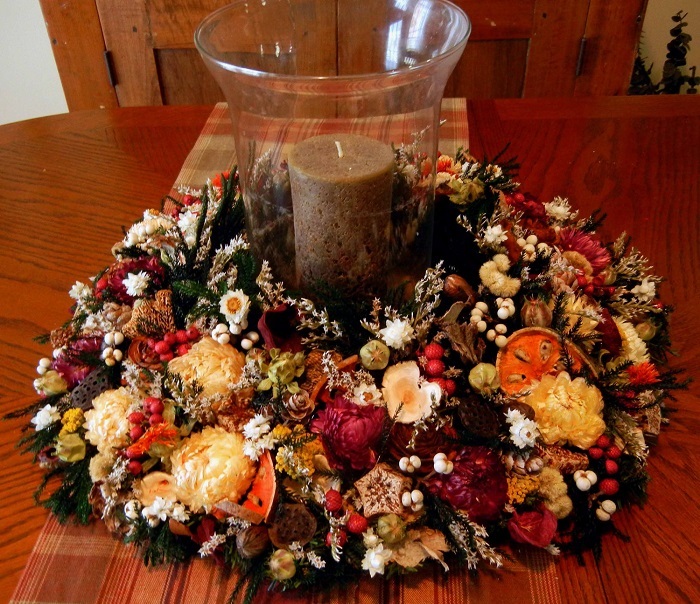 Set the jar with candle on it on the center of the wreath and presto, you have this gorgeous centerpiece! You can also use candles on your Christmas lantern. Just use tea cup candle and let it sit inside your lantern. 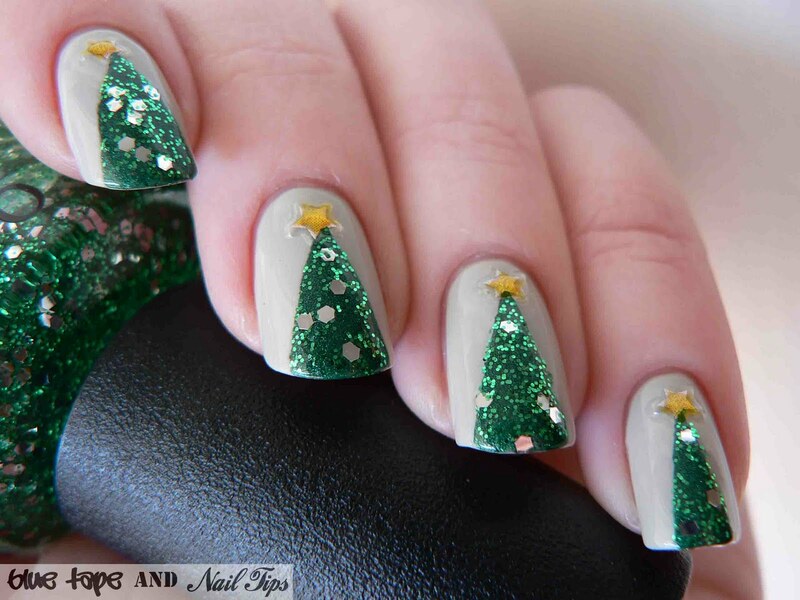 Then, decorate it wit pine leaves, pine cones and hollies. 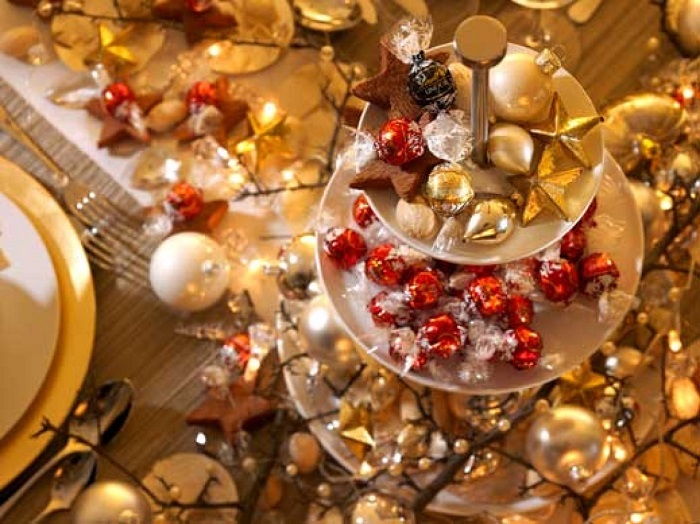 This is one simple but gorgeous way to decorate your Christmas tabletops. 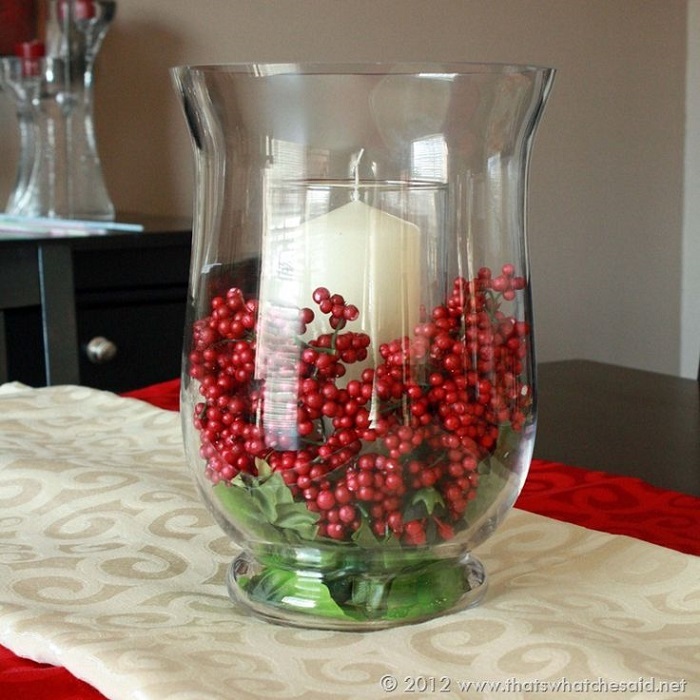 Pick a clear cylinder glass and fill it with hollies and berries. Then let your huge candle sit on the middle of it. 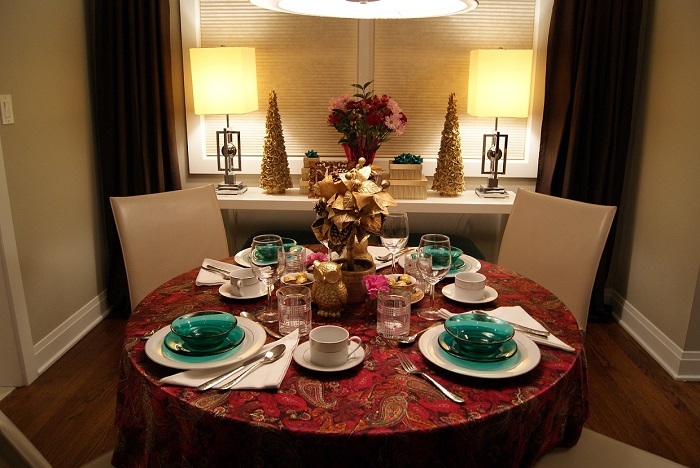 Your dining table is where your family creates happy memories of the holiday season. Make it a hub where everyone can feel the sprit of Christmas. Set it up to where you and family members can feel the air of Christmas. 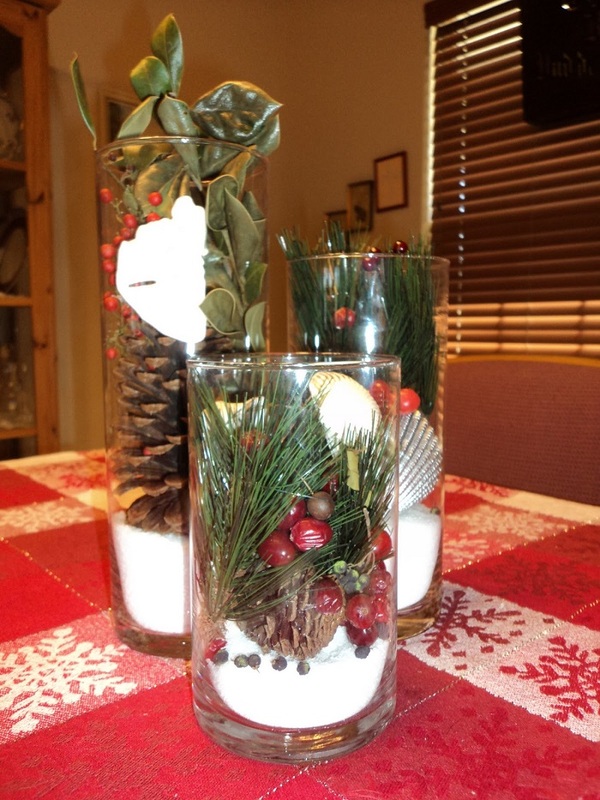 Turn those glass jars into a captivating centerpiece to feel the Christmas spirit. Fuel this cylinder with scented oil or water. Let the candle float on it, with some berries and ornaments below. 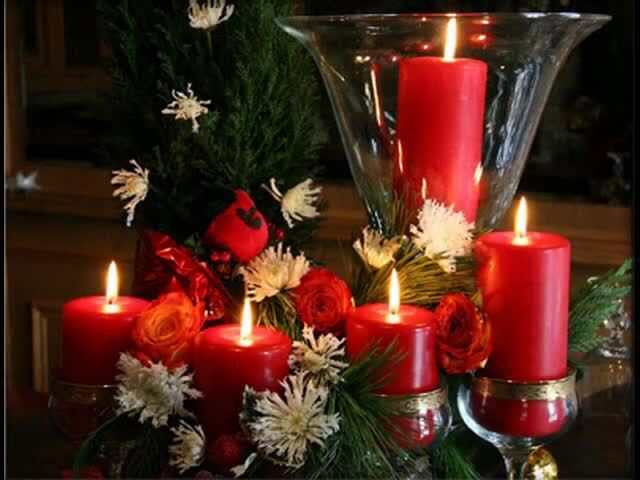 Set a romantic mood on your dining table this Christmas with this candle decoration. A huge chunk of star-shaped candle on the bed or berries, ornaments and greenies can do the wonder. 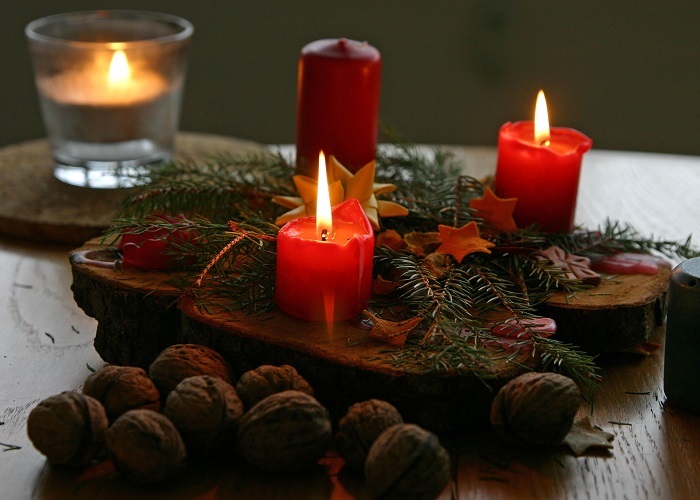 But if you are one of those who don’t want to use the traditional, lit candles, you may opt for artificial ones. 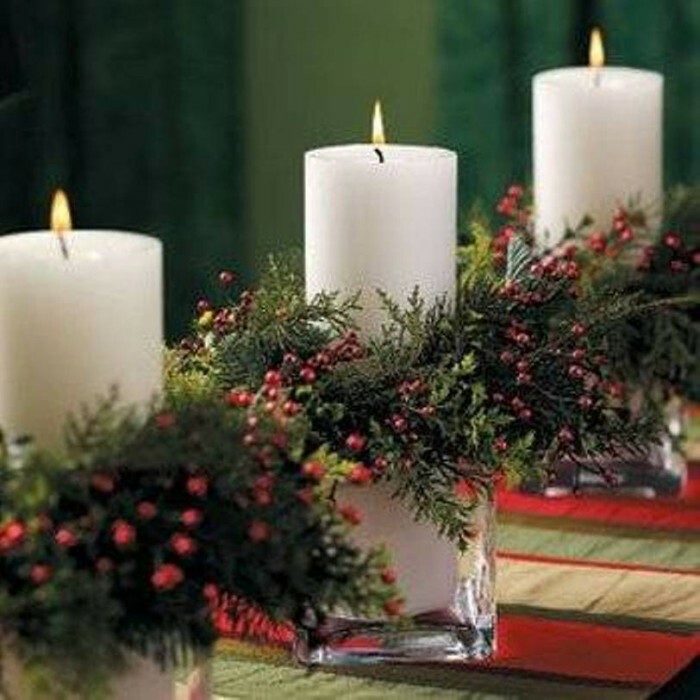 These electric or battery operated Christmas candles can be a good Christmas centerpiece too. 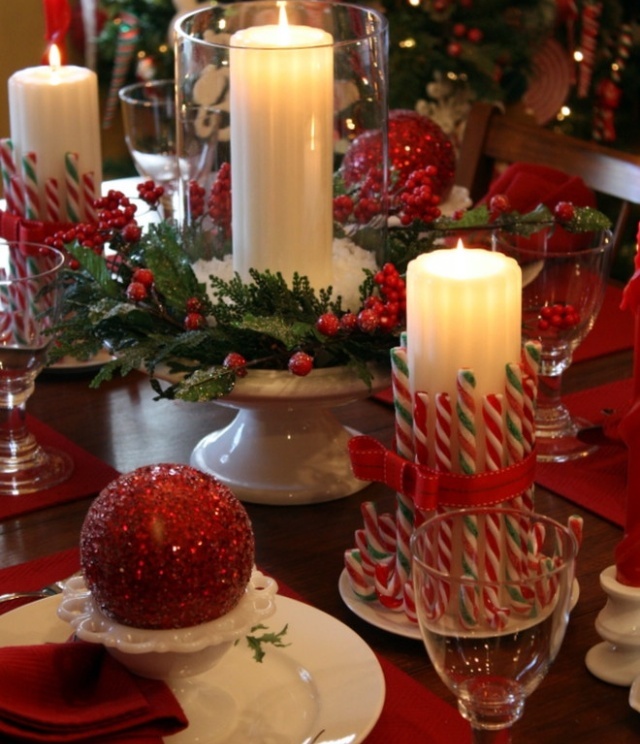 Give your dining table a festive and jolly holiday spirit with these cozy red and green Christmas candles. 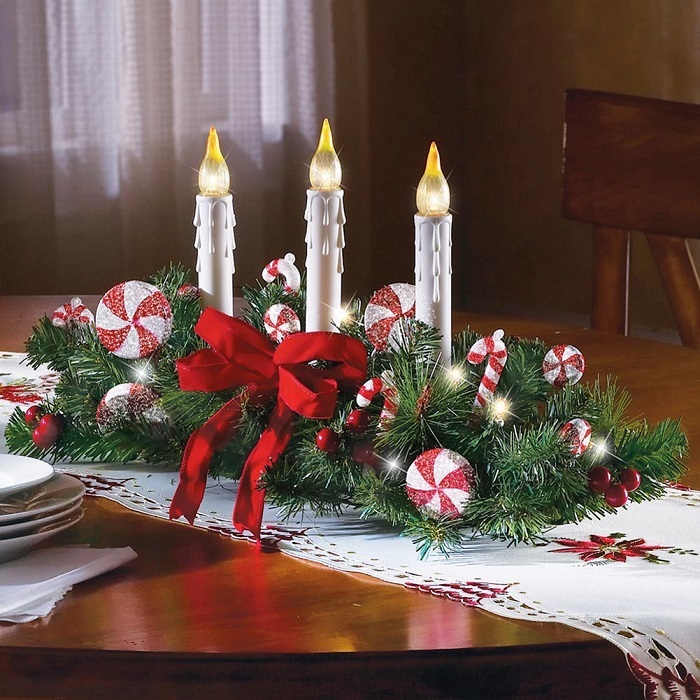 These decorations can make your table more wonderful this Christmas season. 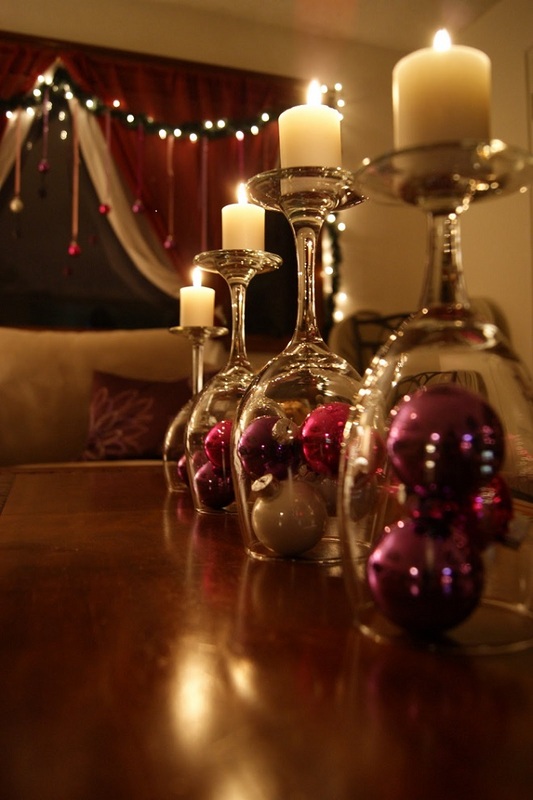 Wine glasses are one of the trending candle holders which you can decorate with almost anything. 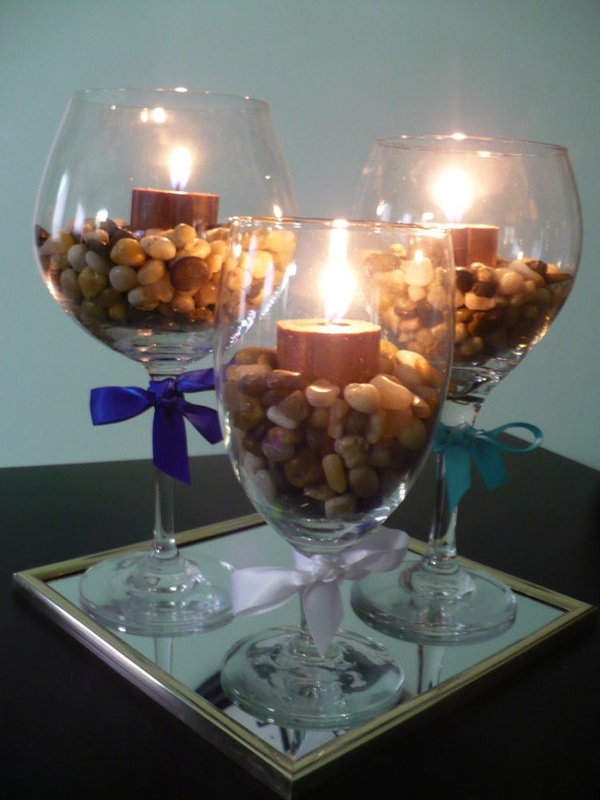 You can use pebbles to fill the bottom part of the glass where you can sit your candles on. 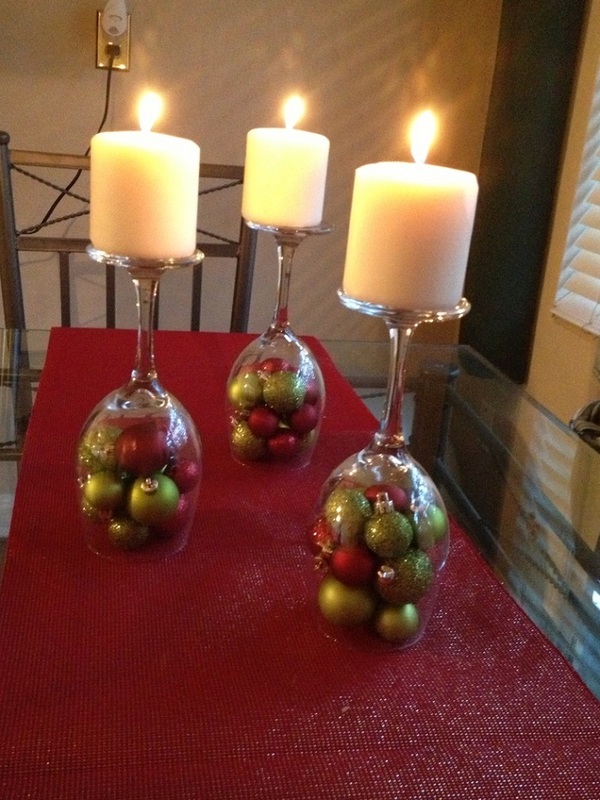 Another way to decorate your Christmas candles with wine glass is by setting it upside down. Put some Christmas balls inside and sit the those candles on the bottom part. You can use other ornaments too. 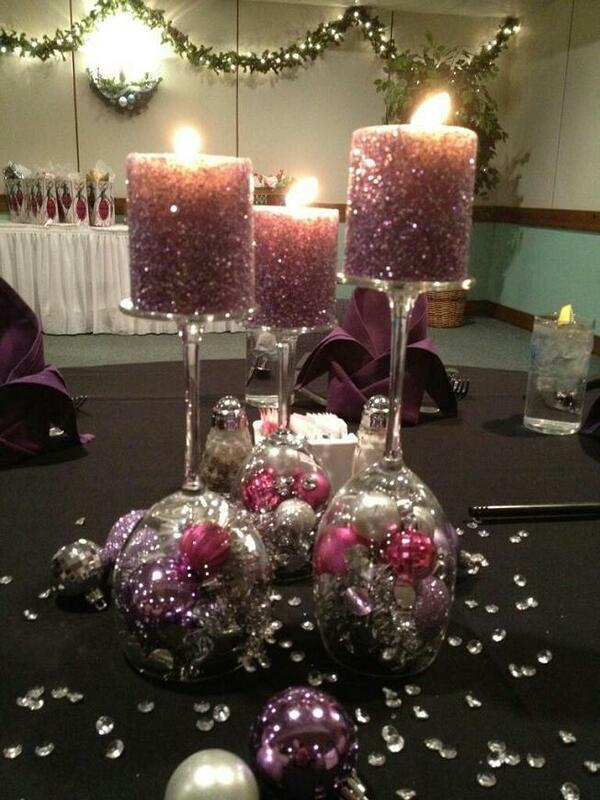 This is one stunning Christmas candle decor. 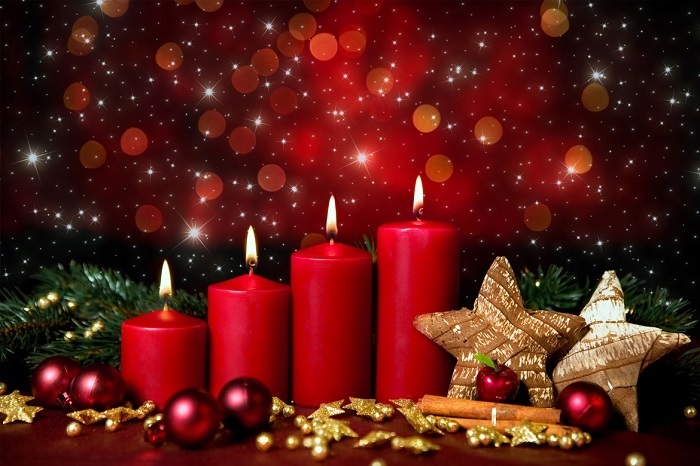 The textured Christmas candles create the romantic and magical atmosphere. This is a perfect for a cozy holiday evening. 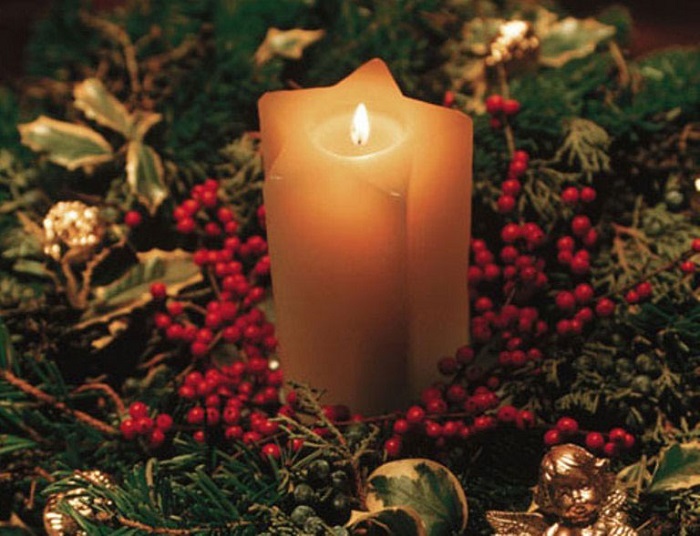 Here’s another spectacular Christmas candle arrangement. 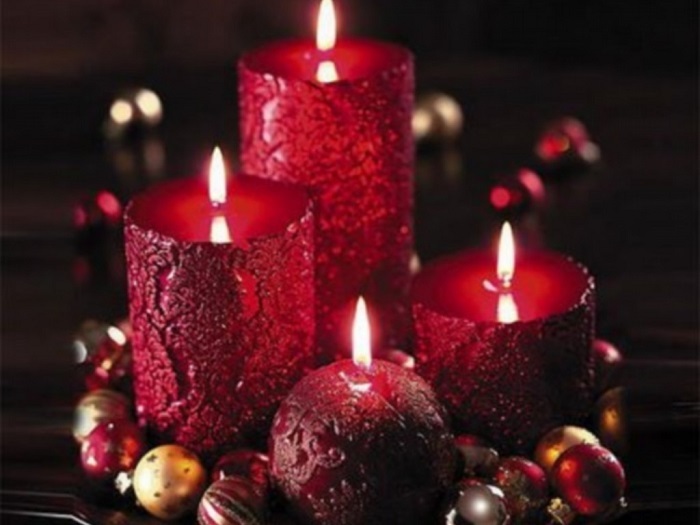 Lit red-colored candles never fail to create that warm and cozy ambiance. Matched with pine leaves and dried nuts on the side, this is one of the best candle arrangement I’ve seen. So beautiful! 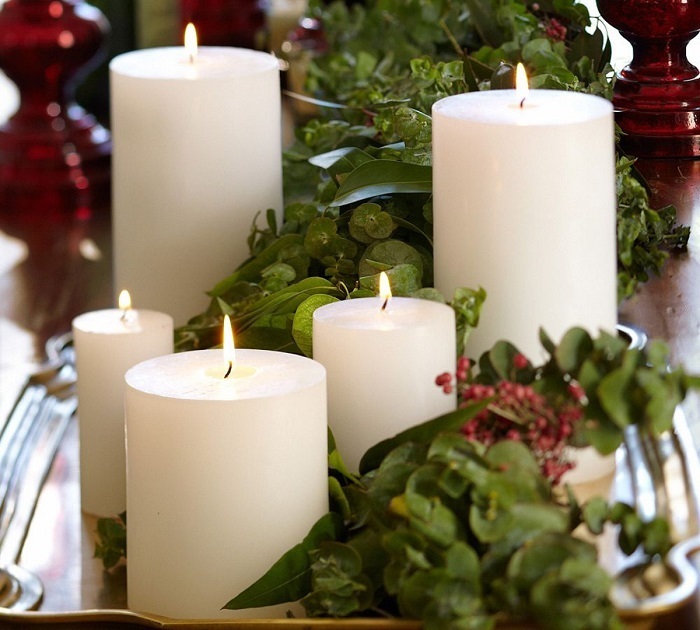 Turn those dull, chunky Christmas candle into something refreshing by decorating it with greens and berries. 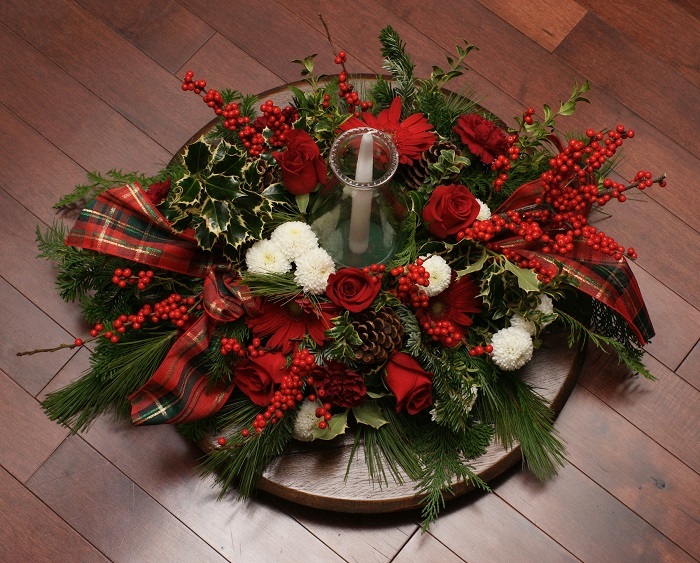 Set it up in a silver platter and creatively surround it with leaves and berries. 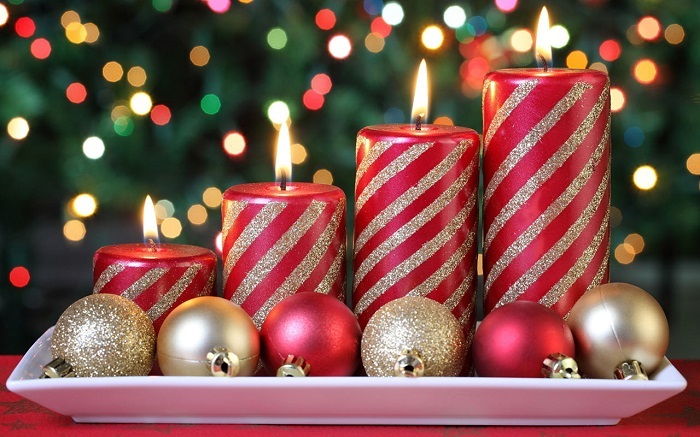 Create an enchanting atmosphere inside your home with these beautiful Christmas candle decorating ideas. The red candle pillars, plus some Christmas balls and golden star ornaments can do the trick. 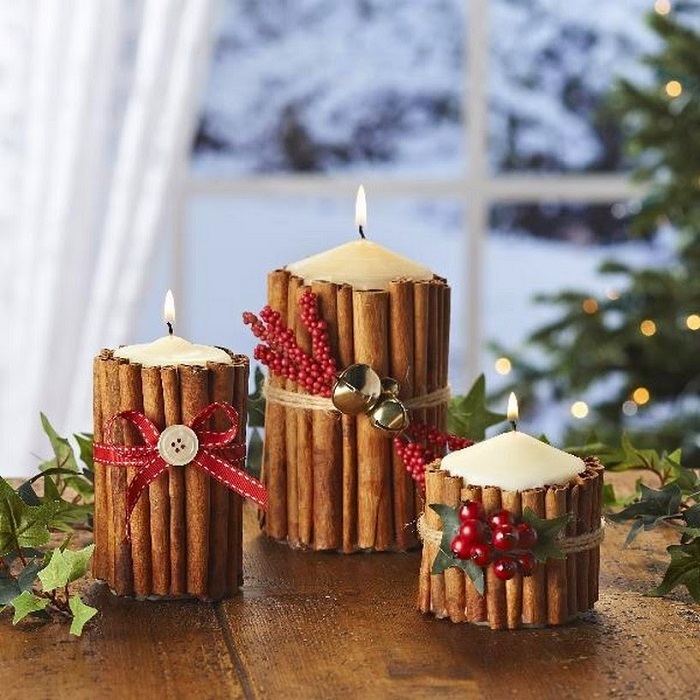 You can reinvent and turn those candles into eye-catchy Christmas decor with some of the materials readily available in your kitchen – cinnamon sticks for example. Wrap some cinnamon sticks around the candles and tie it with ribbon. 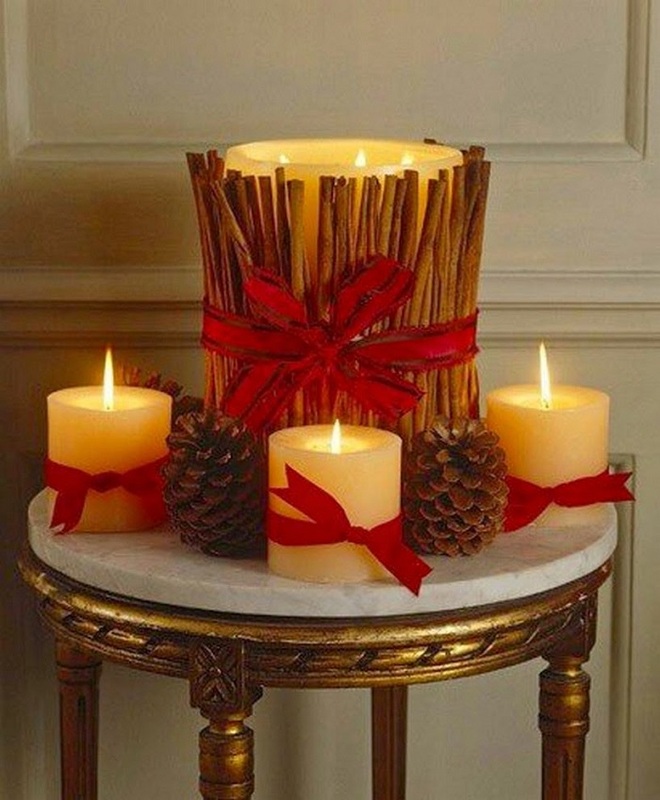 When arranging, you can surround the piece with candles and pinecones. 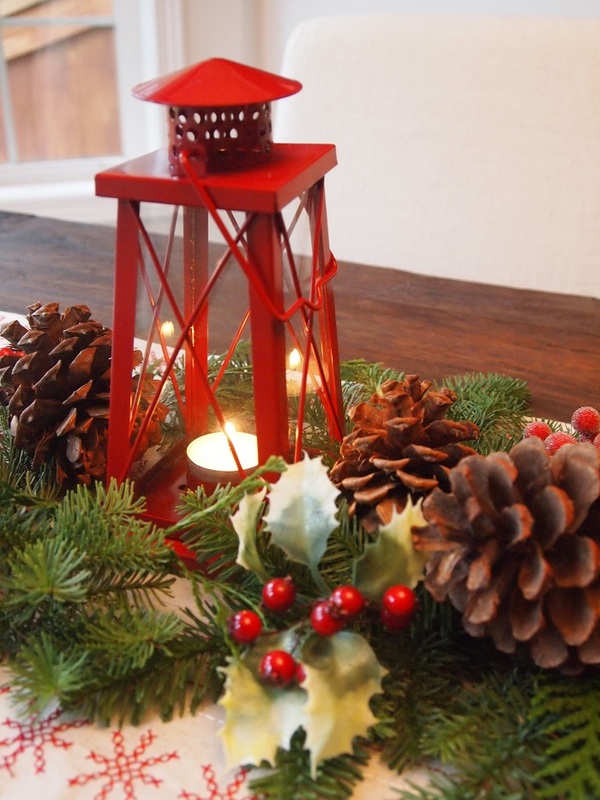 If you’re into rustic Christmas decorating, this idea is for you. 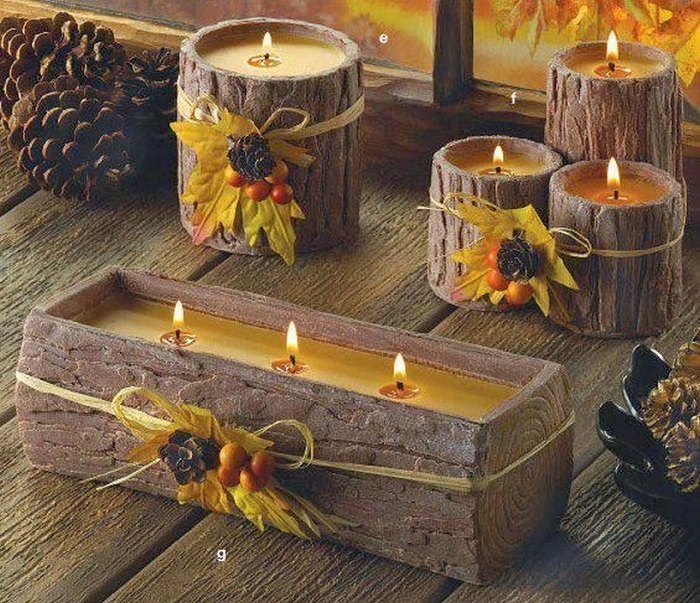 There are faux log candle holders out there that you can buy. Just decorate it with yarn and some fresh ornaments. 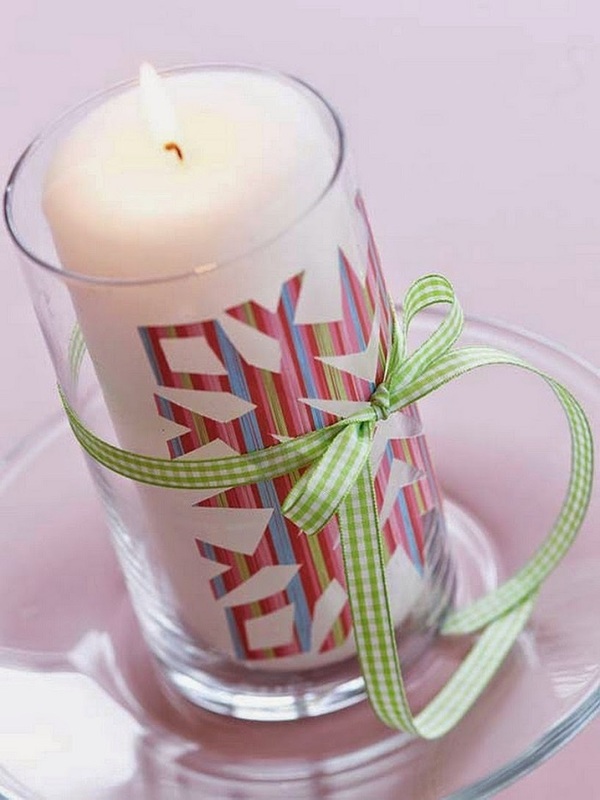 If you have a huge clear cylinder, you can make a beautiful candle holder out of it. Just wrap some burlap ribbon around it and secure with a yarn. Fill it with greens inside and let the candle sit on the top if it. Here’s another beautiful Christmas candle decoration. 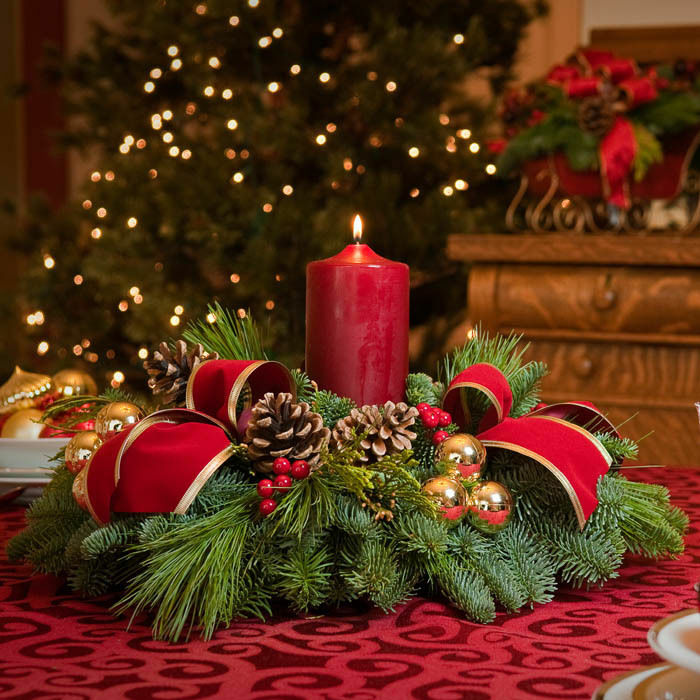 The pinecones, wild berries, gold Christmas balls and pine leaves make this a beautiful tabletop decor. 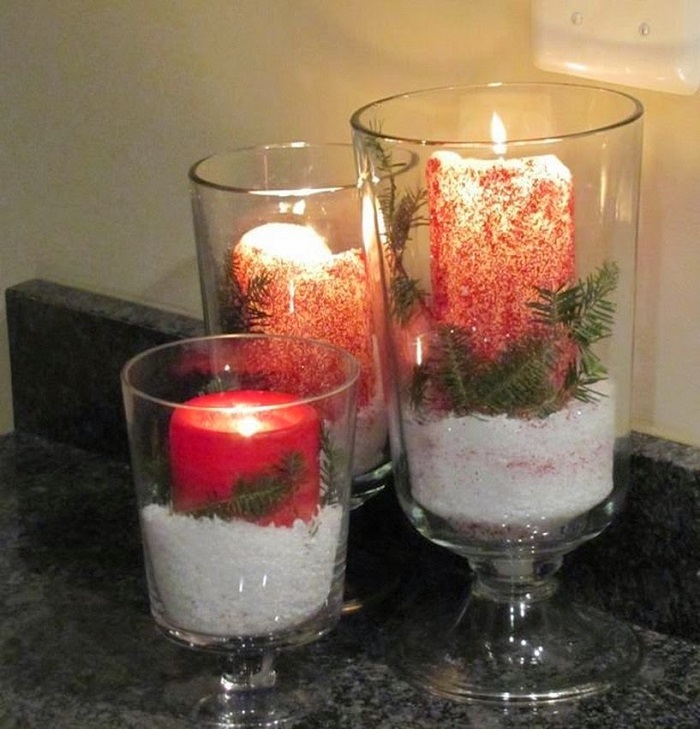 Make use of those excess candy cane and turn those chunky white Christmas candles into something captivating. 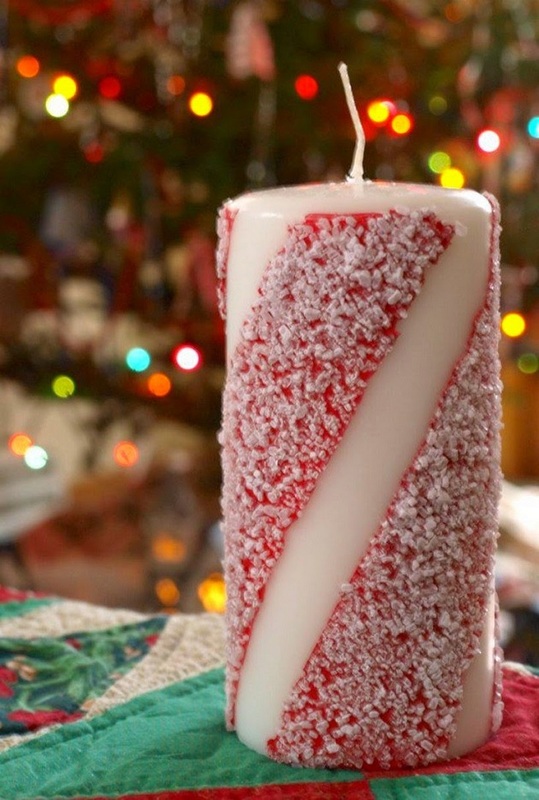 Just wrap those peppermint candies around the candle and tie it with ribbon. Red candles with floral and ornaments are truly a sight to behold. It creates this romantic mood in any room. You just can’t help but to look and be mesmerized on it. 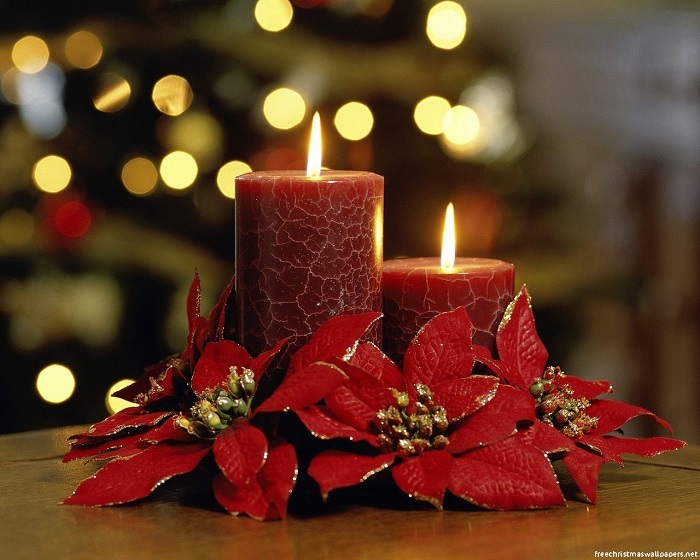 Here’s another delight brought to you by red candles and poinsettia flowers. 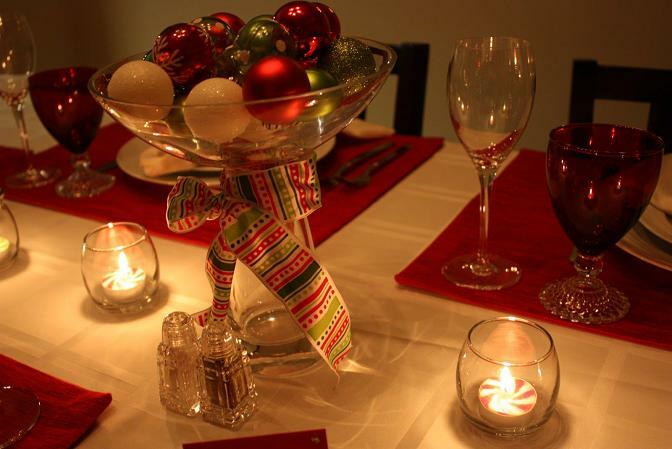 This is a perfect Christmas table ornament in any dining table if you want to have that magical night with your family. 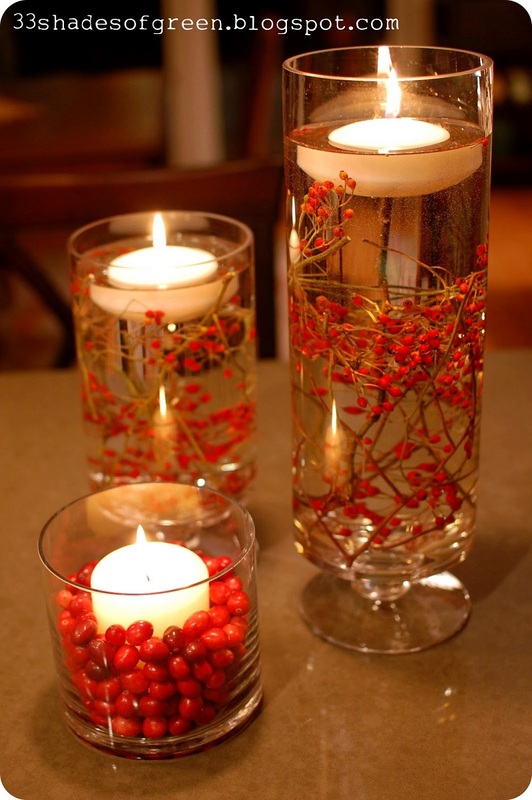 You can turn those simple candle into a gorgeous Christmas centerpiece with this decorating idea. You just need a clear glass where the candle will fit. Then, put some berries and pine leaves on it.